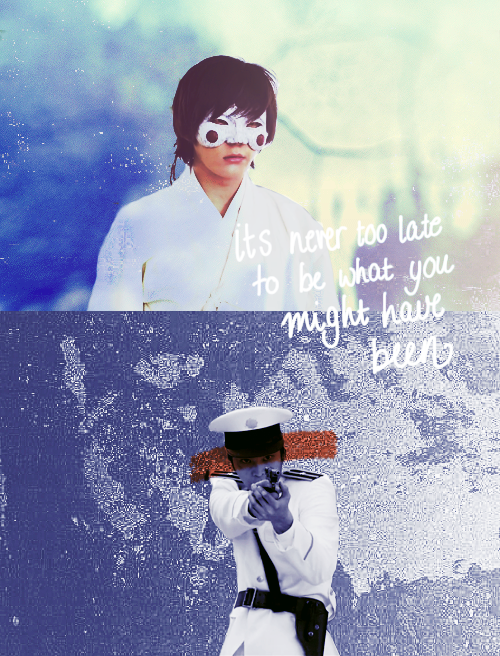 @Jessie15 I don't know, for me, she's not in love with Bridal Mask. She herself might be confusing what she feels as just that because she probably doesn't really know what being in love is. It comes across to me as idolization and hero worship(and really it makes sense, what girl wouldn't fantasize about a guy that keeps saving her? ). You can't be in love with someone if you don't know them. She doesn't know the man under the mask at all. She knows the boy from 13 years ago, she doesn't know the man he is today. Her falling for Kang To is another story and I think once that happens, she will really know what being in love is. Because she has seen the bad Kang To already, now she will start seeing more and more of his good side - knowing and accepting both sides to him, that is being in love with someone to me. And I am definitely one of those people that would like to see her develop some feelings for Kang To himself before she finds out he's Bridal Mask/Young Master. @aikawaringo I think its possible. When all is said and done, she will be able to forgive him for what he's done. I actually think Kang To will be the one that won't be able to forgive himself moreso than her. Maybe I've seen too many other shows where the couples have this very type of set up and the writers make it work. LOL. On TV shows, nothing is impossible for me. To me, Mok Dan is the key for Kang To to heal and live any kind of a life after this is all over. @cravey heeee Never say never, that's what I say. Shooting all day and night for 13th and 14th episodes. Doing actions and competes in practice of course. Drama will also be funny ^^ Expecting a lot of good things. @Secretlyforyou i totally agree with your comment about MD falling for KT. Writers turned bad KT to good KT, good Shunji to bad Shunji when we all thing how is it possible. So they got to show us MD falling for KT. Also isn't KT the main character here and doesn't the main character gets the girl in the story??? After all it is a drama! @cravey as a fellow Delena shipper I understand what you mean about pairs in impossible situations and ships that don't seem like they can work. Lets keep the faith that the writer will deliver and that this show's otp will take off! @secretlyforyou I agree 100%. Fantasizing about a man in a mask is not love. It might be a girlish crush or infatuation. To truly love someone you have to know them, flaws and all. That's love. Its ironic isn't it that its now Kang To under the mask and not Kang San...and yet she cannot tell the difference? I think she would have paid more attention if this was more than just a crush. Right now he is someone she dreams about and has an idealistic view of. Kang To, with his flaws and her issues with him, is still a real guy standing in front of her. I too cannot wait to see their interaction and I agree that I'd love if she started feeling for him before it became a Mok Dan/Gaksital thing. I think a big gesture is needed here. Kang To needs to do something that changes the way she views him quite drastically. Next week might provide that. I think it is realistic to have a man slowly become a hero as opposed to there being an overnight change. Most superhero stories are shown in movies where within the space of an hour and a half, the hero's journey is told. With 24 (now maybe 28) episodes to tell this story it makes sense not to rush it. Kang To had his first big eureka moment when he discovered that Mok Dan was his beloved Boon Yi and then when he lost his brother and mother it devastated him and catapulted him to the point he is at now. His journey is not over and that's what makes this so interesting. He is still en route to becoming the hero...Gaksital proper. He's still finding his way. He's wearing the mask but he has more to learn. He's chosen the right path now and that is what has all of us cheering.I also find it really interesting that his skipping in the forest was due to his decision to help Damsari and not just because of Mok Dan. He's happy that he's doing the right thing. This is yet another step in the right direction. He's beginning to feel it, as opposed to just doing it (like when he avenges his family by killing Kenji). He will become the kind of man that Mok Dan can be proud of and one who she will love. Its like they are both the right people for each other but the timing wasn't right before. We are getting there though. As for his past deeds, I think its important to consider the Context. When he tortured her he was an officer under the regime who had chosen to serve the regime to put food on the table for him family. Like it or not it was part of his job to interrogate people. He is very ashamed about this now and we see how he is unable to continue doing it. Having to whip her in the torture room seemed to kill him on the inside. Another thing to remember is the time. This is set in the 1930s where the Josean people were under the Japanese regime so seeing violence like this was more commonplace. I do not condone it, I'm simply saying that in this context it was almost a way of life for them to be dodging bullets and sessions in the torture chamber. If this happened today it would be considered horrific. Look back at the dramas set in the Josean era or before. A man who did something treacherous would be put to death. Even his family was put to death as part of his punishment. A woman dressing up as a man and being educated (hello Sungkyunkwan Scandal) was considered a huge scandal and a punishable offense. CONTEXT matters. It really does. EDIT: @y101y I love your comment because it just added some levity to all this. The way this is set up, technically he should get the girl. KDramaland rules dictate it! You so rightly pointed out how the characters have switched places. Just like people are so horrified at Shunji's reactions, I wish more people would cheer about Kang To's choice to be a better man. @princess_narnia exactly, if one can forgive killing one's brother (thank God for eternity rings...or not - RIP Alaric ), then one can forgive slaps and whips. @cravey haha, so true. The context in which so many of those things happened really matters. He's a different man now. And even though he shot at her in ep 5, was it? He didn't know it was her at the time. His horror at what he had done was so evident. He's trying and he's working his way towards being someone worthy of her. I just want Mok Dan to have an eye opener and realize that Kang To isn't the same guy anymore. i'm on team Kangto-Mok Dan, ALL THE WAAAYY. mok dan with gaksital still feels awkward to me. it's like she's in love with a ghost--nothing's real about it. her affections were technically first for hyung (heh) anyways, so whenever she's ogling gaksital, i get a little :-/. same goes for the young master-boonyi love. that was your life of OLD, kangto and mok dan. let's move on, k.
Ahh the knife. 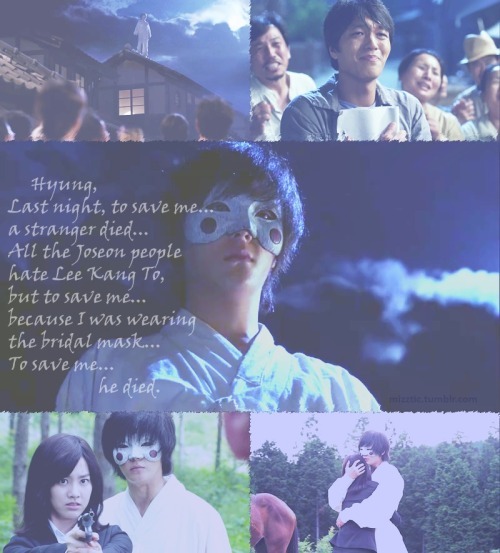 It's the sole identity of Lee Kang To (and Bridal Mask) . An impressive tease from the writer when the knife was not in mokdan's hands when she was in the prison cell with Rie. I'll just mention the most wonderful scene from these two episodes - the hug. When MokDan hugged him, I was all "YOU GO GIRL!" That was such a tender beautiful hug. It's going to take a lot more than a bunch of MD with goofy KT scenes for her to like him. He shot her, tortured her, and tried to take a commemorative photo of capturing her father. It has to be something radical that would prove her that he's changed. Even under "conext", he CHOSE the imperial empire as his way to support his family. Would you call it desperation? Possibly. But even his family, under NO circumstance, would have chosen his route, nor did the mother ever accept or condone it. I'm sorry for all you people who want MD to slowly fall in love with KT as KT, but her memories of old dark KT does NOT offset goofy heartwarming KT. Sure, I can root for for what everyone else wants, but I'm trying to be realistic about it as well. I've been a silent reader for awhile now and I have to come out to say that this drama is A-MAZING! This drama has got to be my favorite drama of ALL TIME! I'm really surprised that there are not more pages on this thread (compared to other dramas that are not doing so well ratings wise). I guess this is what they call "star power"... but in any case, keep up the great work, Drama! I love youuuuuu~~! Totally a Joo Won shipper now! Poor them... Especially Joo Won trying really hard not to fall asleep. class="H" style="margin-top: 0px; margin-right: 0px; margin-bottom: 0px; margin-left: 0px; padding-top: 0px; padding-right: 0px; padding-bottom: 0px; padding-left: 0px; border-top-width: 0px; border-right-width: 0px; border-bottom-width: 0px; border-left-width: 0px; border-style: initial; border-color: initial; outline-width: 0px; outline-style: initial; outline-color: initial; font-weight: 400; font-style: inherit; font-size: 26px; font-family: 'Open Sans', 'Helvetica Neue', Arial, sans-serif; vertical-align: baseline; line-height: 1.4em; color: rgb(30, 30, 31); text-shadow: white 1px 1px 0px; background-image: initial; background-attachment: initial; background-origin: initial; background-clip: initial; background-color: transparent; border-top-style: none; border-right-style: none; border-bottom-style: none; border-left-style: none; border-width: initial; border-color: initial; background-position: initial initial; background-repeat: initial initial; "@Crazy LuLu yes that's part of the problem there no? Earlier it was Kang San under that mask and Mok Dan had this dreamy view of this masked man. It hasn't changed even though its now the original Gaksital's younger brother under that mask. So she is in love with this image or idea of this hero. No doubt he's a freedom fighter/vigilante, but she doesnt' know him.Thank you for mentioning Boon Yi and Kang To back when he was her young master. So true. Right now Mok Dan thinks of him as this perfect guy but she's in love with a memory of him. She needs to love a guy in the present and if its her young master then she needs to love him as he is now for it to be the real thing. I'm so with you on this. @mizztic right at the start I used to wonder if he would redeem himself. At the moment even I'm wondering how. He's a tragic character in that I feel if he continues down this road it will just get worse and the only way he can redeem himself is if he does something at the end to save Kang To or Mok Dan. If he realizes what he's doing is horrible he might even get a chance to redeem himself without having to die, but it all depends on how far he goes. As it is, his violence towards people is scarier than Kang To prior to his turnaround. Kenji was always a rougher, more cruel guy and it was evident even in the way he treated the old nanny who looked after them. 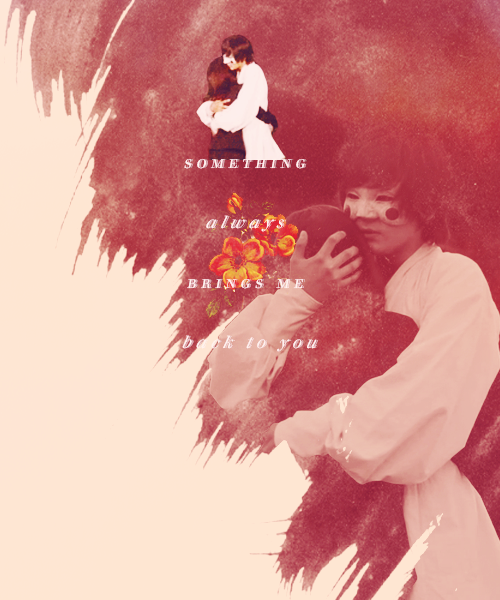 Shunji was sweet with her and we see from the flashbacks that Shunji seemed genuinely good to Kang To. He was kind to him when Kenji and the other boys in that club were beating him up. So it will be interesting to see if Shunji can retain his humanity or if he realizes what he's doing. His confession to Kanto about being scared that he was turning into a monster is very telling. He KNOWs its happening. It must be scary...but he's also losing control.Oh and I remembered that Shunji, like his father Kimura Taro, has joined that secret group. The head of that group is merciless. If they fail their missions, its certain death it seems. I love that graphic you made. That market place scene was a nice moment. He must have felt that lightness in his heart when he realized what he had done for these people. The boy he gave the bills of sale to was the same guy who had called him a dog and hurt his brother, isn't it? It says a lot about Kang To's change of attitude if he can turn around and start helping people who clearly had it out for him. Even now, without the mask on they will scorn him. But he's still going ahead and doing what he can for them. He's slowly learning to help his people. @stoffkimba I hope so too because I'd hate to think that they'd jump to live shoots for the next lot of episodes. They have so much left to film the schedule would be crazy for the cast. Not to mention the fact that Joo Won also films 1N2D! :oOh goodness, so true about TMtEtS. It was one of those shows that could have been done as a 4 part miniseries. I think it was stretched out so far that people were just hanging about on screen most of the time. OMO your description of how Mok Dan sees Gaksital had me giggling her for a few minutes. You're so right. He's an idol star of sorts for her. And yes they have been really clever about it so far. I found him having to watch her pretty interesting. They are just bickering right now and she did try to stab him several times (fiery pair, aren't they? 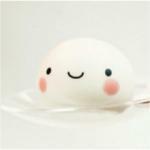 ), but she is noticing that he's softer now. His behaviour seems to baffle her. And then in episode 12 he very clearly informed her that there was a mole in her group or among the people she knew. I strongly believe that it made her edgy and more guarded...so much so that when Rie visited her in her nun disguise, Mok Dan's brain was just thinking differently. kang To had just left after warning her and she automatically started watching what Rie was doing. I think she would have been that way with anyone actually. But Rie was suspicious so she tested her theory and then fed her the false info. Nice going Mok Dan. Now when it comes back to her that her suspicions were correct she will know that kang To had helped her. It was not an accident. He very clearly helped her. She's going to wonder what on earth is going on. I'm loving it. Your comments about Kang San and the rebels sometimes putting the cause before their families. I love you to pieces for saying this. Kang San actually thought about what it would mean if they found out he was Gaksital. He had a moment to think about it and continue to play dumb. I have always been one of the people who had this unpopular opinion that Kang San kept his family in the dark and that it came back to hurt him. 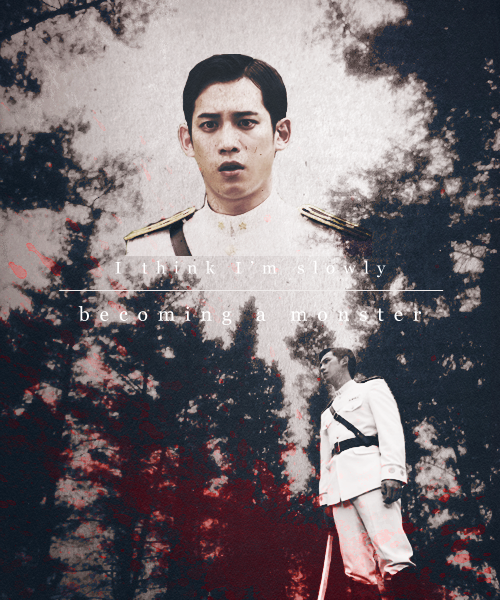 His brother had no idea his hyung was not mentally affected by the torture. I can understand that Kang San faked mental illness to get out of the torture camps-its human instinct to want to survive. But that he kept it a secret from his family troubled me no end. 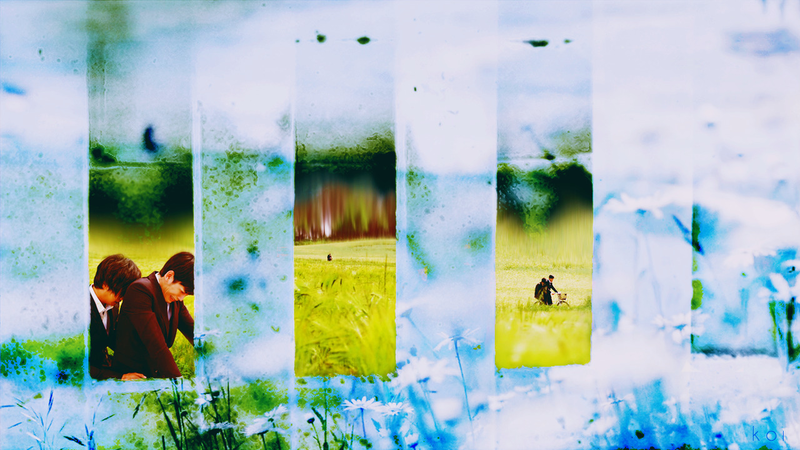 His mother and brother spent years believing he was no longer sane and that they had "lost" him. Imagine the mental agony for them? His poor mother? And like you so beautifully said, Kang To had be be the breadwinner. He supported his hyung who spent time running around with the neighbourhood kids.It broke my heart when Kang To confessed to Kang San that night, that he was only doing this for his family, that Kang San didn't clue him in on what was going on. Yes, Kang To was chasing Gaksital. But if he knew his hyung was Gaksital he would never have hurt him or given him up. Ultimately Kang San's deception got him killed, by his own brother. So now Kang TO carries that guilt too. Kang To actually put his family first. That is why he joined the regime in the first place. He felt it was the only way to put food on the table. He saw no other alternative other than begging-and lets face it, that was not something that would provide for them. Joining the regime might have made him a traitor in the eyes of his own people but he was willing to carry that burden if it meant providing for his mother and brother. When he shouts that Lee Kang To is pathetic or cannot do anything and Sato Hiroshi is who he is, he is actually saying that by serving the regime he can make things happen. He can provide for them. As Lee Kang To, the son of a Korean family in poverty, he's helpless. Its a horrible situation to be in. I don't know what I'd do in that situation. I'd hate to be forced to choose. Desperation makes us do crazy things. This is the only way out young Kang To saw. I also feel that the hero Kang To is becoming won't see things in such absolute terms. Its not all cut and dry. There are grey areas and I think Kang To will make tough choices in his role as Gaksital. Choices his freedom fighter hyung did not make or could not make. I think that will set Kang To apart. Coming from a country that has seen colonisation and then civil war I know it can be crazy and that some things become a norm for people during a particular period. This show clearly shows that. Regarding the quote thing, I'm not sure hon. I am actually typing this on a notepad before posting, lol. The new soompi is a bit different and I'm still getting used to it all. They're still shooting ep 13 and 14? Why are they so behind? I wonder what MD will do when she finds out BM is KT. I also have a feeling that she will find at a moment there is no time to think long whether or not she accepts the fact or not. I mean everyone knows there is a connection between MD and BM. They will continue to use her to get him. What if he get's really badly hurt when he tries to save her when she's used as bait again? Or that he gets badly hurt on one of his other missions and the bodyguard guy isn't there to help..I think he will go to MD then too. At the end of the day she's the only person he can trust. He can't go to Sunji because as soon as he finds out KT is MD he will get killed even before KT had the chance to tell what his brother did to his family. @kurisutaru Yes, I have seen the BTS video where they showed JW and KW falling asleep on the set .. I feel a lot of affection and appreciation for their hard work to bring us viewers a wonderful action packed drama. I do fear for their health as we are just only half way through the drama, there are still 14 more episodes to go and if they keep at this rate, it is going to the death of them by the end of the drama. It will require a lot of strength for them to keep up since this is an action drama. Seeing them fall asleep like that on set, I suddenly recall the scene where he came to see MD and she told him to go to sleep because he said he is tired LOL JW/KT really needs that 10 minutes sleep. Also heard the news that JW's and JSY's voice will become KBS's automatic voice on the phone. I hope the rating will climb up and stays up... BM's casts and crews deserve it. I hope it will bring a lot more viewers. I love reading all your comments and I know that the majority of us here are rooting for KT-MD. Although I have my doubt but I am also one who would love to see the pair as KT-MD and not KT-BM because I can't see the emotions underneath the mask. I also found the scenes of KT-MD are much more interesting and enjoyable. You can feel the emotions boiling over between those two as if they can't stand the sight of each other and yet underneath KT is yearning, begging for MD's recognition by looking into his eyes, to know him as her "Young". The scene BM was hugging MD in ep12, I was trying to read the emotions in his eyes, by a twitch of his lips or something to indicate his respond to her initiation by hugging him but I can't read anything there... so damn frustrated. If she thinks BM is her "Young" then by falling for KT, wouldn't she feel that she is cheating on her first love? At this stage, I am conflicting myself as to whether MD see BM as her "Young" or not so hopefully that part will be cleared up soon. As for their first kiss, I don't know how it is going to turn out. A little awkward may be? What are your guy thoughts on this? JW is known to be shy but he has done a lot kissing with other actresses in other dramas but I have seen only one from JSY in her previous drama - My Daughter the Flower (I am curious about YSY so just begin to look for her drama last night) and oh boy, I can see that she was really shy and not THAT responsive. In one of the recent article about the horse riding scene, it also says that although JW and JSY are getting closer after 5 months but they are getting nervous due to the increase of mellowed scenes.